The overall effect is so real it's unreal - all the more so with digital media. The rustle of a breeze. Fingertips on frets. Distant thunder. Shoes creaking. Cicadas in the grass. The flautist's intake of breath. You're there, simple as that. I have Kef 203 reference floor-standers for mains, Kef uni-q for rear, and had a Kef IQ60c for center. I recently replaced the Kef IQ60c with a Kef XQ2c. It was an impressive improvement mainly because of the XQ2C's 6.5" uni-Q drivers. It was cheaper than buying a KEF 202 Reference center ($2,200.00) which also has 6.5" drivers. Check your body for gunshot. It is SO REAL. I bought this speaker with a pair of front speakers Kef iq9. I was replacing and upgrading my old front speakers Kef Q75, and my central VIETA-JMLabs. My advise?. Go directly for one of this ones if you have the chance. And do not ever forget that the speaker includes a "reference" hyper tweeter ... Also it design is ... huge; huge and beautiful, hugh and nice design, hugh volume and weight.... a product which has been also designed for looking at it. My system is composed by Harman-Kardon AVR 8500 + The Bijou equalizer + Marrantz DV7000 + Kef Q55 as rear speakers + JBL 250 as subwoofer. Now I think I go it!. More natural reproduction of voices than my old Klipsch. Smooth and non taxing to the ear...Beautiful! Power handling, awkward shape makes placement a bit more difficult than conventional center channels. Great center channel. Upgraded from an older Klipsch model that I sold to a coworker. Voices sound more natural, rich and deep. The speaker is only rated at 120 watts rms, but in reality we hardly ever use the stated watts of our amplifiers, so it shouldn't be a big deal. This is a beautiful speaker, at some point I will have a dedicated home theater and be able to display it! Clear, warm, natural voices. Detailed highs and adequate low end responce. For the price I paid this was hard to beat. By itself this speaker sounds good, but as with any center that is not full range, a decent sub helps fill in. My previous center was a Klipsch RC-3 and although the specifications for the two speakers are very similar, to my ear at least, the KEF hands down outperforms the Klipsch. Voices are much more rich and natural sounding, and as it turns out, this center blends much better with my mix-n-match system (my main speakers are the discontinued Monsoon FPF-1600's). Ultimate Electronics has discontinued carrying KEF and had there floor model XQ2c for sale at half retail...couldn't pass up to see how this center performed at home. I can say I am more than happy with my purchase. Voices sound real and brings a new new dimension to music as well as movies. Gorgeous looking speaker. I bought this center along with my XQ5's and simply love it. I would definitely recommend this center. It's well suited for music as well as for home theater. I had an Infinity Beta C360 center and it just doesn't compare with the KEF. To be fair it's not even in the same price range but even so it's well worth the extra money. As with the rest of the XQ line, it's got a very distinctive shape with all sides(including the top and bottom)curving out and back in. I find myself dusting and polishing it all the time just to get that extra shine. This also comes with the Hyper-tweeter(same tweeter used for the reference series..it actually says "Refernce Series" on the tweeter) which adds another dimension to the highs. It also has the Uni-Q array which includes the mid frequency and high frequency units arranged co-axially). I feel like I'm hearing voices much more clearer than before and makes music listening so much more enjoyable. It's a great match with the XQ5's and the construction quality is up there as well. Its big, its beautifull and it weighs an absolute ton! 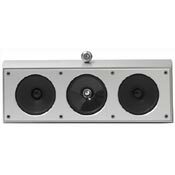 You will not be dissapointed with the quality of make or sound from this centre speaker. the first time I heard this speaker I was gob-smacked - it was that good! I part-ex'd my Q9c and I'm totally happy! Just buy this centre!